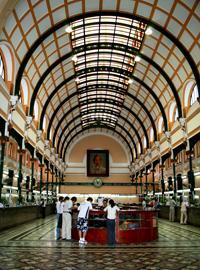 Upon arrival at Saigon’s Tan Son Nhat Airport, you are welcomed and transferred to your hotel. Rest of the day is at your leisure. In the evening, you will have welcome dinner with the authentic Vietnamese cuisine. In the morning you will departure for the Cu Chi Tunnels. The Cu Chi Tunnels are an impressive network of tunnels with a length of over 250 km. This strategic place was used by 15,000 Viet Cong fighters during the war. The underground network provided sleeping quarters, meeting rooms, hospitals, and other social rooms. Arrive at the tunnel gates, we will watch the movie of the war time. Then we have time to inspect the tunnel site, visit the gates, traps, underground hospitals, worships, kitchens, bunkers and go through a section of the tunnel. Our trip ends and we transfer back to Saigon in the late morning. At 8 hours, you will be picked up at the hotel and head out of town to the Mekong Delta. This plain region boasts the largest rice bowl of Vietnam. Around 9h30, arriving in My Tho, you board a motorized boat navigating around the intricate small canals, which is a great way to observe the local lifestyle close-up and catch a view dotted by many islands. The exciting river trip will pass by the lush green vegetation towards the famous Unicorn Island where we have a chance to stroll around an orchard, taste seasonal fruits and see a traditional music performance, “cai luong” by local people. We navigate some narrower canals using small rowing boats to Ben Tre Province for an interesting visit to some local industries. The extra enjoyment is a lunch at one of the famous local eating spots. Especially, you will have a chance to be on horse-drawn carriage or local transport “Xe loi” (nowadays, it is often seen on movies). In the afternoon, around 2 hours, you will take a drive back to Saigon. Check out hotel and transfer to Tan Son Nhat Airport for the flight out. End of services by Indochina Travel Service.